Webinar details redesigned rendering backend of open-source toolkit. 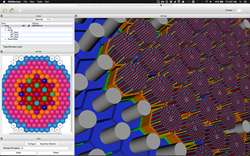 Faster rendering in VTK proves crucial for interactive reactor design within the Reactor Geometry Generator tool in Computational Model Builder. On Linux, with an NVIDIA K5200 graphics card, the initial render time for one of the benchmark tests included with VTK dropped from over 14 seconds to under two seconds for 20 million shaded triangles. To accompany the Visualization Toolkit (VTK) 7.0 release that occurred at the end of January, Kitware made a recording of its release webinar available to members of the visualization community. Kitware hosted the webinar live on February 3, 2016, to offer exclusive insights into the latest VTK developments. During the webinar, David DeMarle, a lead developer of VTK at Kitware, discussed the new default OpenGL backend that allows VTK to render larger and more complex visualizations with millions of primitives. The updated backend also increases speed as much as 350 times, reduces the system memory footprint, and provides users with fluid interaction and instantaneous feedback when drawing models, performing molecular and volume rendering, and implementing immersive environments in VTK. Development on the backend began in 2014. The VTK team focused on enhancing rendering performance and on increasing the compatibility of the toolkit with mobile operating systems such as iOS and Android. In particular, Kitware collaborated with NVIDIA on Embedded-System Graphics Library (EGL) rendering compatibility as well as with Intel on OpenSWR and OSPRay efforts. The resulting enhanced capability of the new VTK backend has already benefited ParaView, tomviz, and Computational Model Builder. An upcoming release of 3D Slicer will benefit from the backend as well. As noted in the webinar, more than 70 community members participated in the 7.0 release. Thanks primarily to the work of longtime contributor David Gobbi, VTK became compatible with Python 3. Other work introduced algorithms based on Flying Edges to cut contour extraction times for large meshes from minutes down into the sub-second range. For more details on VTK 7.0 and to download the latest version of the toolkit, please visit http://www.vtk.org. VTK is an open-source, freely available software system for three-dimensional (3D) computer graphics, modeling, image processing, volume rendering, scientific visualization, and information visualization. Originally written as part of the textbook “The Visualization Toolkit: An Object-Oriented Approach to 3D Graphics,” the toolkit employs Kitware’s quality software process based on CMake to produce robust code. Today, commercial as well as research and development applications throughout the world use VTK. These applications include ParaView, 3D Slicer, VisIt, VisTrails, MayaVi, and OsiriX. Kitware provides support for VTK through custom consulting, training, and documentation resources. To learn how to leverage VTK and Kitware’s expertise in high-performance computing and visualization, please contact kitware(at)kitware(dot)com. This material is based upon work supported by the Department of Energy under Award Number(s) DE-SC0007440.